For the complete citation see 45 CFR 46.111. The term risk - benefit assessment is preferred rather than the metaphor risk-benefit ratio. The reason is risks and benefits are not measured using comparable scales. Risk is measured in terms of probability of harm while benefit is an aspirational hope whose probability generally can't be measured. Assessment of the possibility and importance of potential benefits to subjects (if any) and to science and society. The research may be approved by the IRB provided that the benefits outweigh the risks to participants. Risk is assessed by the probability and magnitude of potential harms that may befall a participant from an intervention or monitoring procedure. the characteristics of the research subject (age, health status). It is the investigators obligation to explain what will be done, by whom and to whom and where it will be done. Protocols and applications that incompletely describe the study procedures frequently result in requests for more information. Minimal risk means that the probability of harm or discomfort anticipated in the research are not greater in and of themselves than those ordinarily encountered in daily life or during the performance of routine physical or psychological examinations or tests. The meaning of minimal risk is hotly debated partly because the definition creates 2 separate standards (risks of daily life and the risks of routine procedures) but also because it isn't clear how to index those risks - the lives of healthy children or the lives of the proposed study population. The debate regarding how to index risk appears to be settled. The overwhelming majority believe that risk should be indexed to the lives of healthy children living in safe environments. To do otherwise would justify exposing more vulnerable children (sick children or those in risky living situations) to greater risk in the research context. The risks of routine examination (stethoscopic exam, palpation, ear examination, etc.) are generally fairly trivial. To limit participation of healthy children to such minimal risks would be to halt research progress. The risks of daily life include risks that may seem too great for healthy child volunteers. For example, the risks of driving in a car include severe injury, post-traumatic stress, disability and death. Death occurs at a rate of 0.06 per million car trips. The daily risk of death for children is approximately 1.5 deaths per million children per day. The IRB reviews the information provided by the investigator about the possible harms and the likelihood of those harms when assessing the level of risk of a procedure. In the eIRB application, the investigator is requested to make their assessment of the level of risk. The IRB takes all of the information and then tries to determine if the risks are consistent with one of the two standards for minimal risk. Parents use their judgment to determine which activities they'll allow for their children. 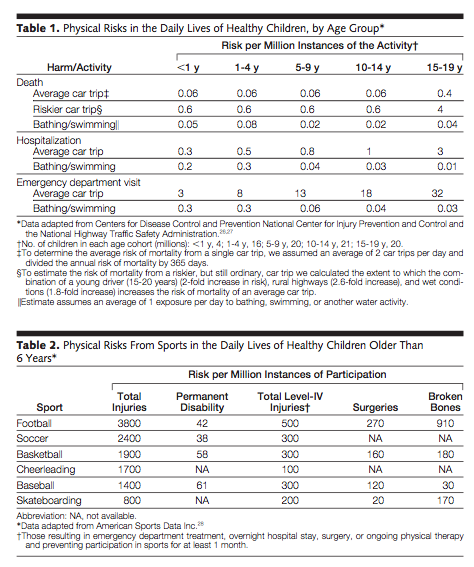 Most parents will permit their children to play basketball or soccer, even though these sports carry risk of harm (table). On the other hand, many parents don't permit their children to play football, or their teens to drive late at night by themselves. The risks of these activities could be said to carry at least a minor increase above minimal risk. Unfortunately, the exact risk of study procedures, even common ones, is frequently unknown. When this is the case, the IRB is forced to rely on its best judgment and precedent. The IRB may weigh the risks to adult participants against the benefits to society and science and decide (or not) to allow the research to proceed. When vulnerable subjects take part, the regulations place limits on the extent of risk permitted. Children may only participate in greater than minimal risk research (more than a minor increase above minimal) when there is a prospect for direct benefit. Direct benefits to subjects can never be guaranteed. The history of medical research is littered with physiologically plausible interventions that have failed to work. Approximately 9 out of 10 new therapeutics that undergo testing in humans fail in clinical trials. Research that offers the participants a prospect for direct benefit is the most one can hope for. Or benefit to society and to future patients, which arises from the results of the study. What is the basis for assessing prospect for direct benefit? When the investigator proposes that the research offers a prospect for direct benefit, they must then support that contention with sufficient evidence for the IRB to reach the same conclusion. Failure to provide sufficient information to support the claim of benefit inevitably results in delay in approval. The investigator has an ongoing obligation to update the information supporting the prospect for benefits to subjects. Reports from the literature, warning letters, SAE reports or results from other ongoing clinical trials that alter could alter the IRB's assessment of prospect for benefit (positively or negatively) must be reported promptly to the IRB.